Here’s my latest Therapy Guide from teachmetotalk.com and myei2.com! If you’ve liked my DVDs and Therapy Tip of the Week clips, then this Therapy Guide is for you! Therapy Guides are PERFECT for parents or therapists who want immediate information without waiting for a DVD to arrive in the mail! It’s an ideal solution for those who live outside the USA and parents who want something they can do TODAY to help their child. Learning to talk during Verbal Routines is a critical, “in between” step for many late talkers. 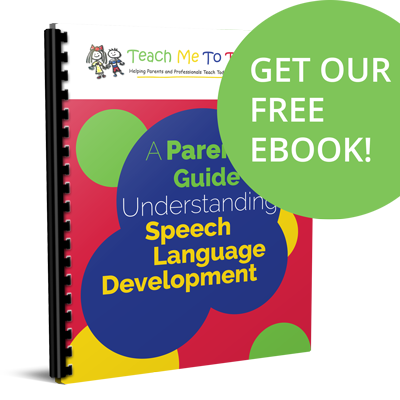 Creating Verbal Routines is designed to teach you how to develop and introduce verbal routines to toddlers with language delays and disorders. A Therapy Guide consists of two components for helping you learn to work with a young child with a language delay/disorder. First, you’ll receive an access code to view an instructive video. 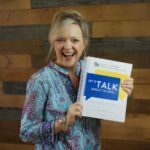 In this 68 minute video, I’ll explain what a verbal routine is and why this strategy is successful with ALL young children, including those with language delays, provide lots of examples for developing and using your own verbal routines, and then finally, show you 30 minutes of therapy video clips when I’ve used verbal routines in speech therapy sessions with toddlers and young preschoolers. Because this is REAL LIFE therapy, there will even be clips when it doesn’t go as smoothly as we’d like. As I always say, that’s okay, because therapy is REAL life. No actors. No Hollywood set. No sound studio. This video is real life therapy in a real office and real homes with a real therapist, real kid, and real parents. Secondly, you’ll receive an 8 page written summary sent via PDF to pair with the activities demonstrated on the video. If you’re a therapist, this Therapy Guide is written in a “hand out” format and can be shared with parents as a part of your caregiver education plan. If you’re a parent, you’ll have written instructions in your hands to help you remember what you’re supposed to be doing for your home program. 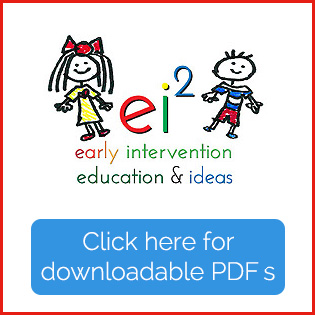 This information is appropriate for use by speech-language pathologists, committed parents and grandparents, occupational and developmental therapists, early interventionists, preschool teachers, and other professionals who work with toddlers with language delays and developmental concerns. Creating Verbal Routines Therapy Guide is $19.99.